EMS Dr. Thomas Wünsche CAN Bus Systems are supported by a fully integrated software framework for interfacing Windows and Linux based user applications with CAN bus resources. 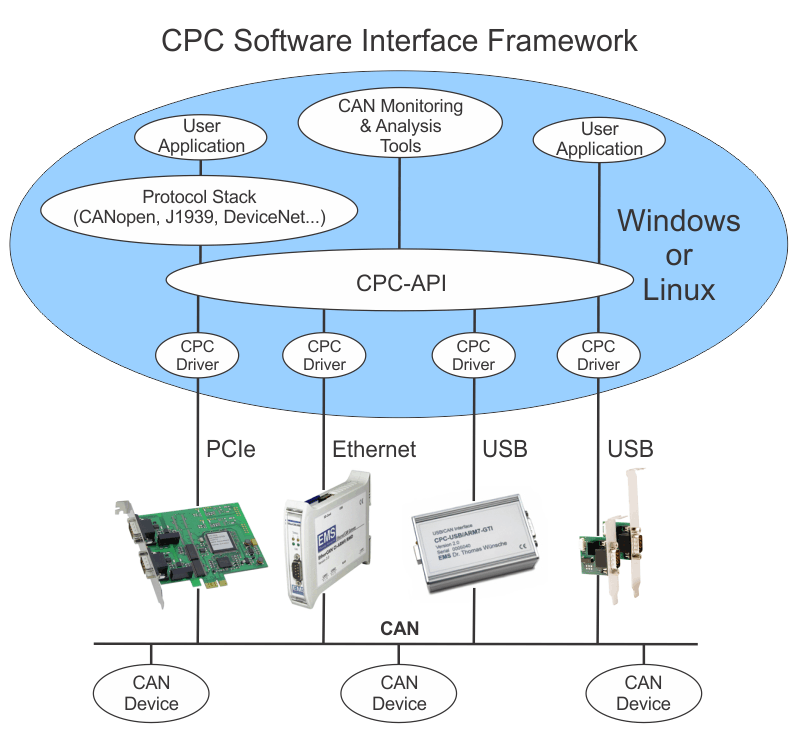 The CPC software interface framework includes the CPC-API Application Programming Interface, device drivers for the various CPC series CAN PC interface products, and the CAN-Monitor CANBus Monitoring Suite. Alternatively, SocketCAN can be used with Linux, which provides its own vendor independent software interface model. The CPC-API and CPC device drivers are included with the Windows and Linux CPC Software Development Kits, which provide the software needed by developers to implement their own applications utilizing any of the CPC family of PC CAN interface products. The CPC-API provides developers with the maximum possible flexibility and cross-platform portability, with a software interface that is independent of hardware configuration and host bus interface (e.g. USB, PCI, PCI Express, etc...).